130215 New trip to France booked! 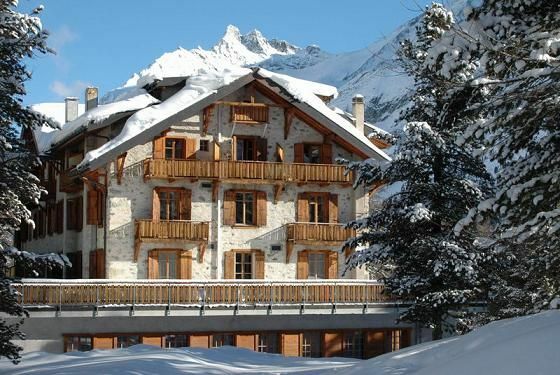 In a few days in going down to Val Thorens for some skiing and hopefully get a couple video edits. 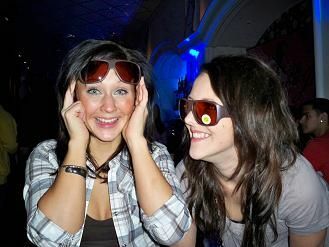 After that Im hoping for a happy reunion with my friends in Engelberg for some days. Gonna be good fun! 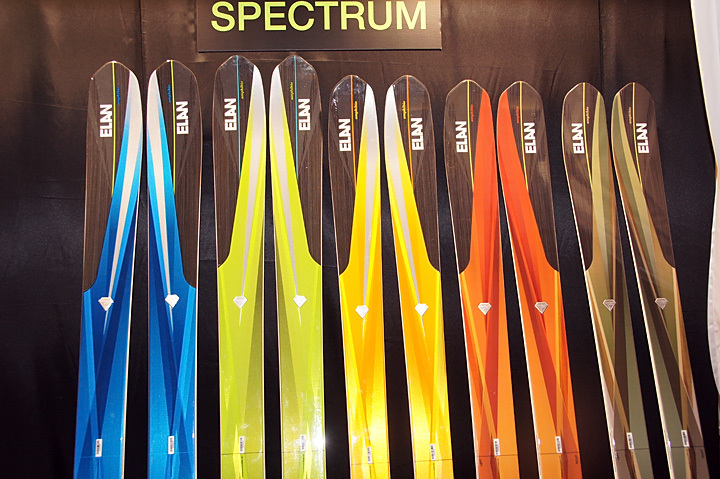 130125 New skis from ELAN! 121008 CHECK IT OUT! Today Dr Zipe will launch the brand new HEALER. This google is supreme with outstanding visibility due to the big frame, great durability and italian guality double lens. 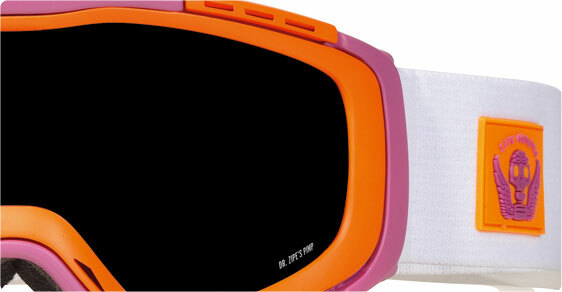 I have tried this goggles last winter and they will for sure be my first choice during the season. This is attitude! Home after a weekend down in Gotheburg with the Zipe - team. Fun to finally visit the institute and great to meet everybody! Drop back soon for some photos! 120815 Rider meeting with DR ZIPE! In late September we will assemble the team of patients for a clinic and photo shoot in Kung�lv,the headquarter of Zipe Institute. Check back some some updates and sneak peaks of what to come! 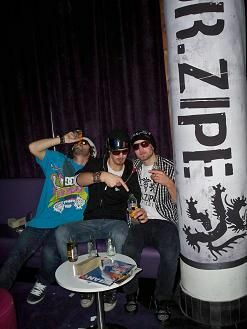 Until then drop by the new website of www.drzipe.com! * New website will hopefully be launched during the fall! 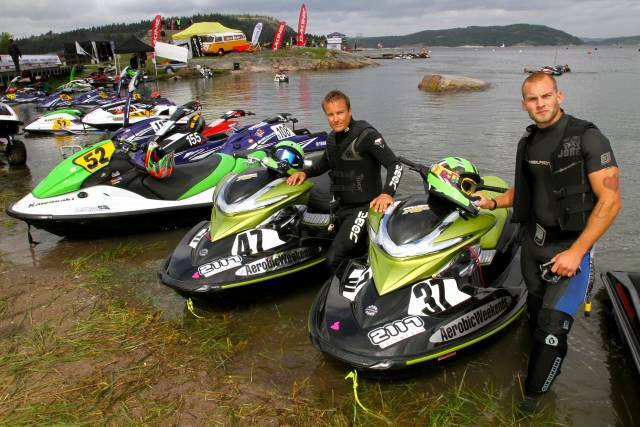 120725 I found some pics from a race in the Swedish Championship serie for Runabouts. Summer season aint so bad after all! Photos by Aerobic Weekends. 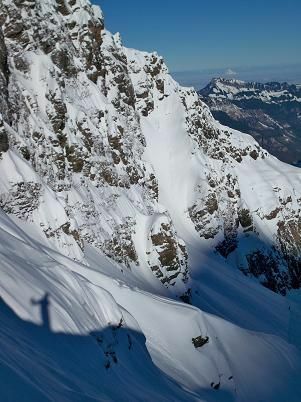 Photos from Engelberg late March. 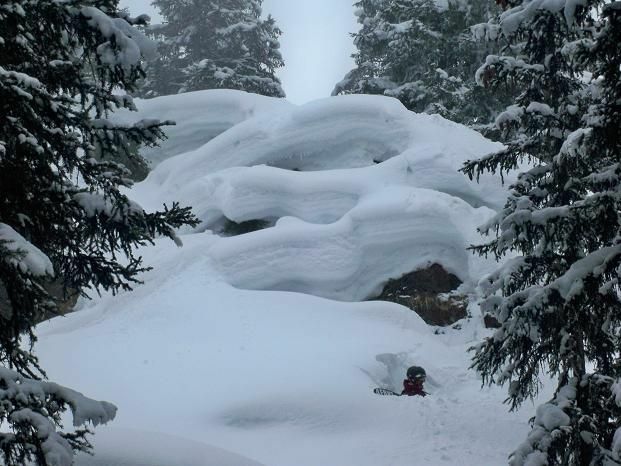 After a few days of heavy snowfall we had great conditions on the mountain and managed to get some real bangers! Here is a couple of them... All photos (C) to Jesper Molin, if you are interested in a certain photo please contact Jesper at info@jespermolin.se or visit www.jespermolin.se! 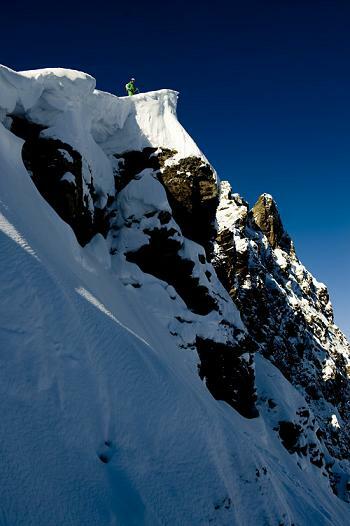 We found this nice cliff to jump and I managed to get loads of snow with me on the way down. Nice ride! Checking out the flight before take off! 120209 Just booked the flight back to Zurich! 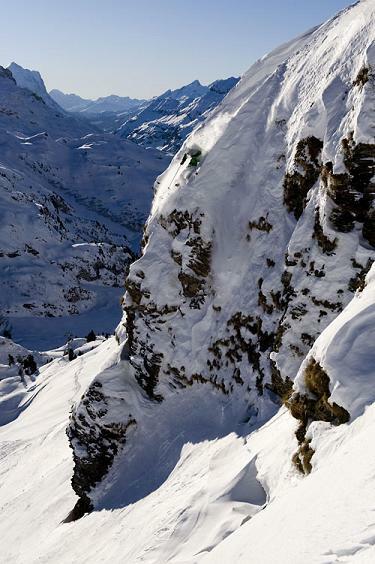 In a couple weeks we will do another photoshoot in Engelberg and Airolo. Now lets pray for some snow and focus on the Sports Physiology exam. In Disentis we managed to get some nice bangers and have a good laugh at my old friend Flodas hotel and pub "Nangijala". 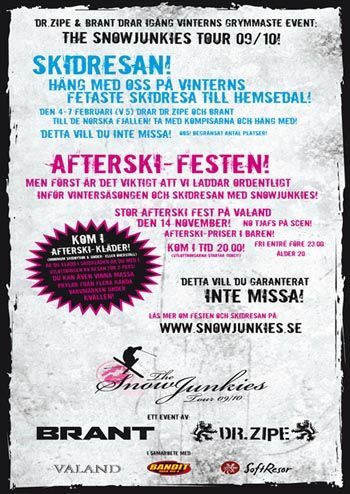 The place to be for every Scandinavian in Disentis... and probably all the other skiers aswell I quess. 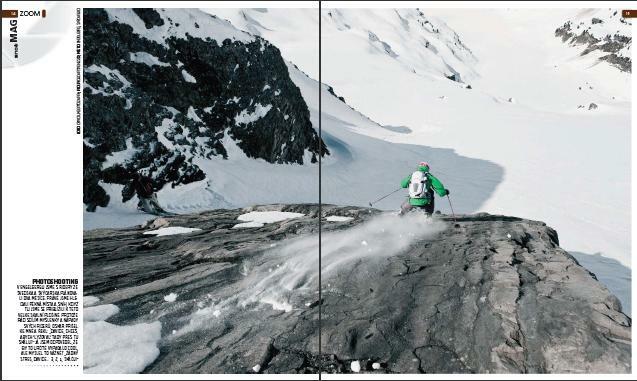 Below and above is a sneakpeak from our work in Disentis this time! 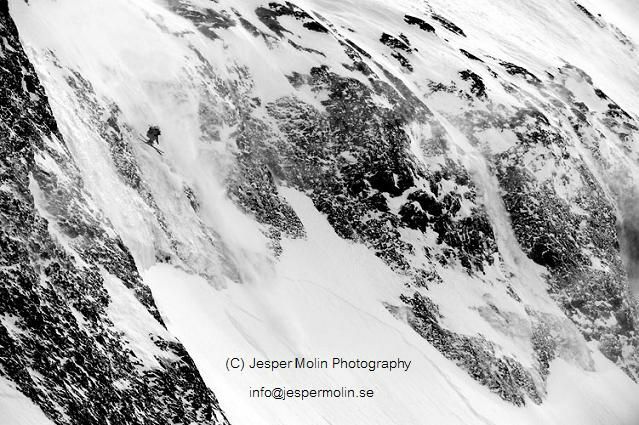 All Photos (C) to Jesper Molin Photography ! 120110 In the beginning of January I hooked up with a couple of friends for a skiweek in Kittelfjall. 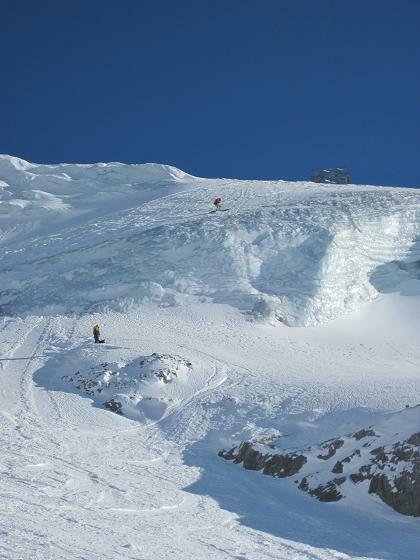 Freezing cold but great skiing and lots of fun chutes and features on the mountain. 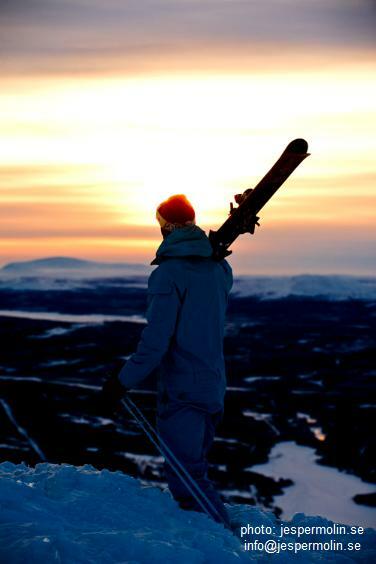 Kittelfjall is a little bit like Swedens "Klondike" and so far Skistar haven�t been able to control this resort. Great destination if you want to check out from the big city life. 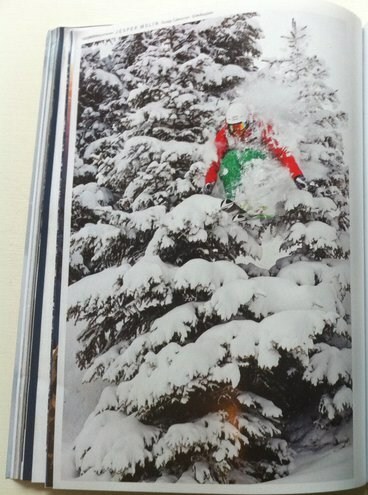 120105 This image was in last galley of the magazine BRANT. 11220 Christmas in Tandadalen! The Swedish mountains in Dalarna might not be know as the most deadly but after a nice snowfall and almost zero people on the mountain we actually managed to find some really nice chutes and fresh powder around the area of "Vaggen". Merry Christmas everybody! 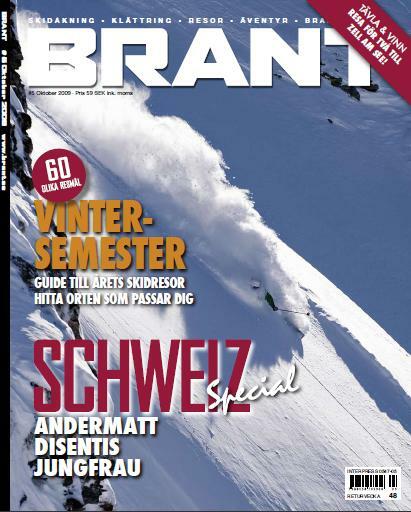 111215 New photo in next issue of BRANT magazine, I will post a picture from the mag soon so stay tuned! 111122 Even though winter may seem faraway in Sweden the season is just about to kick of! 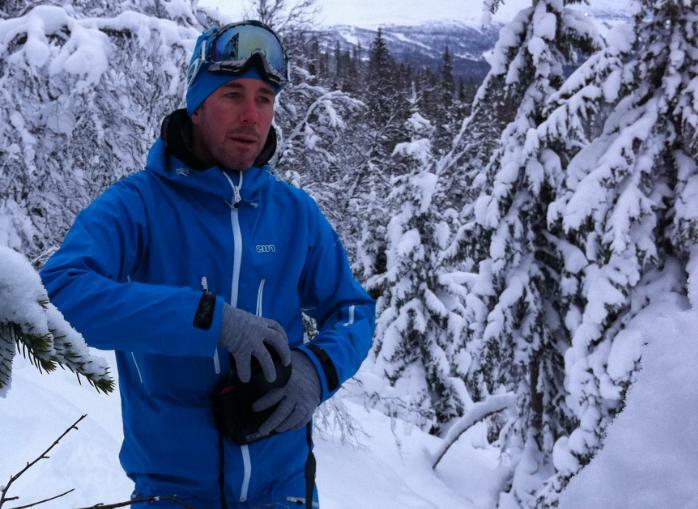 Hopefully I will be able to go and catch up with my mates Hasse Mute, Patrik Leidstedt, Jana Lindqvist and Linus Archibald during the classic Ski test in Salen later this week! 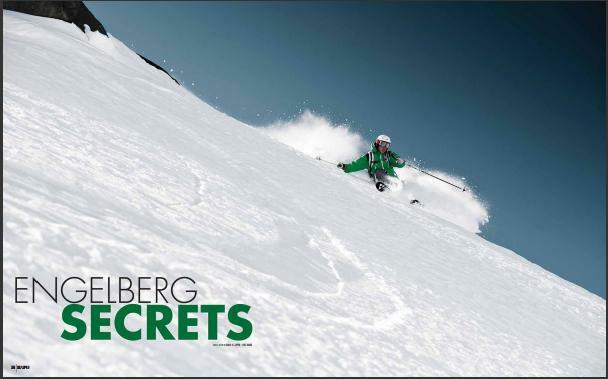 111118 I found this pic on the web from a windy day in Engelberg, published at SKIING INTERACTIVE. Speed is your friend they say! ;) Photo: Jesper Molin. 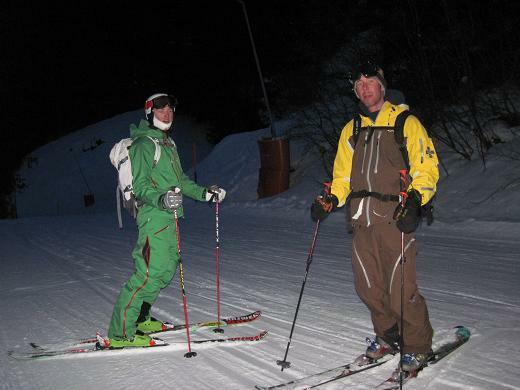 111113 I will be skiing with ELAN SKIS this season also. 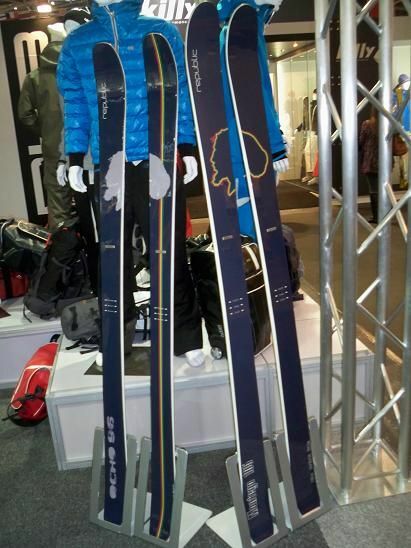 Check out their products at: www.elanskis.com . 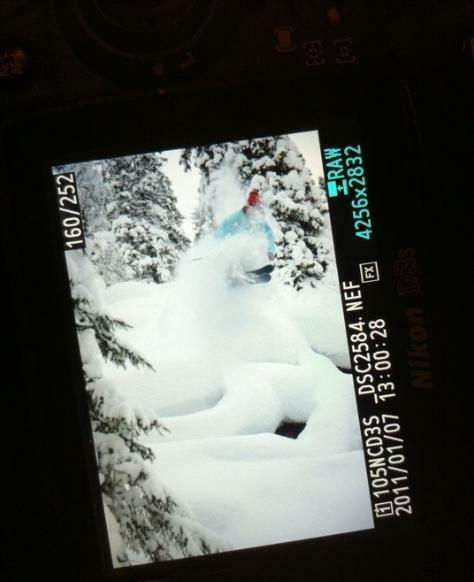 Check back soon for some photos of ELAN SKIS! 111025 I am happy to keep representing the wonderful world of DR. ZIPE even this year! Soon they will update the webpage so drop by and get zipenized! ;) Here is a preview of their brand new model PIMP! 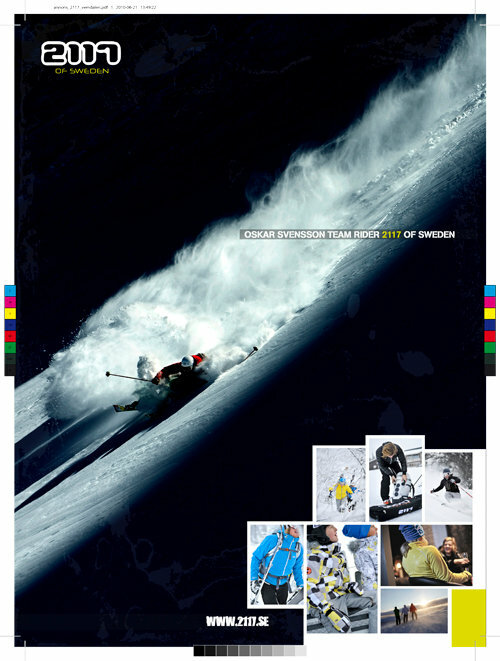 110815 Check out the latest advertisement from my clothing sponsor 2117 of Sweden! 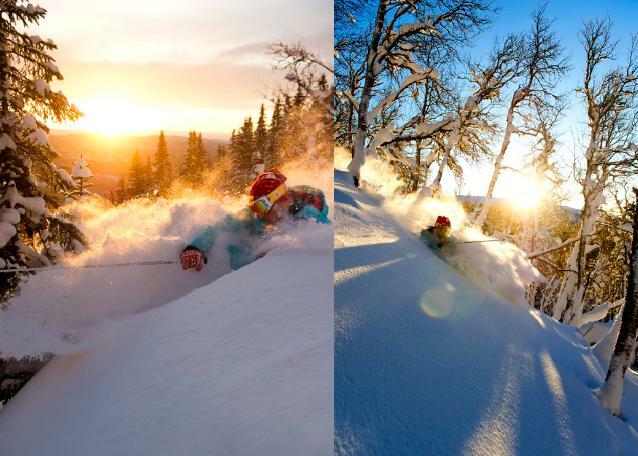 Me and Jesper found this spot with waist deep powder a late afternoon in Are around new year and and the sun and backdrop was just perfect. The ad will be published different magazines during the upcoming season. 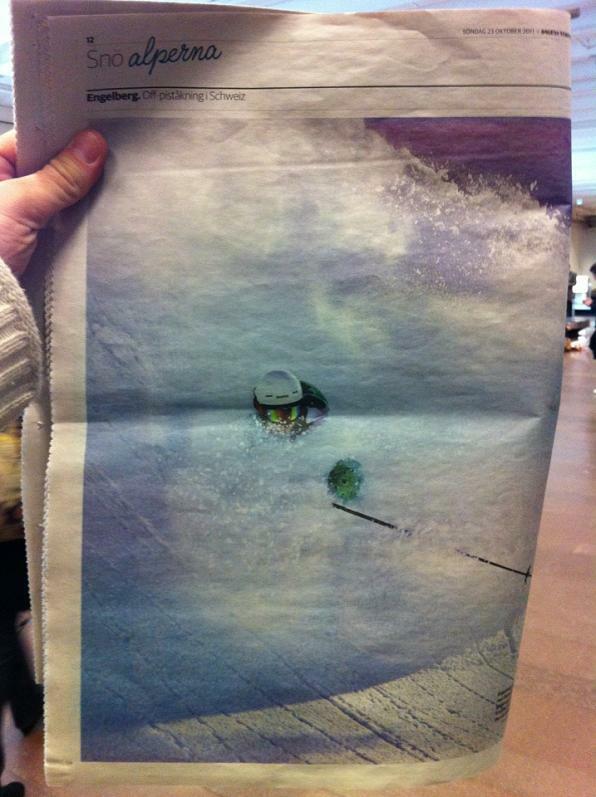 Big ups to Jesper Molin who took the photo. 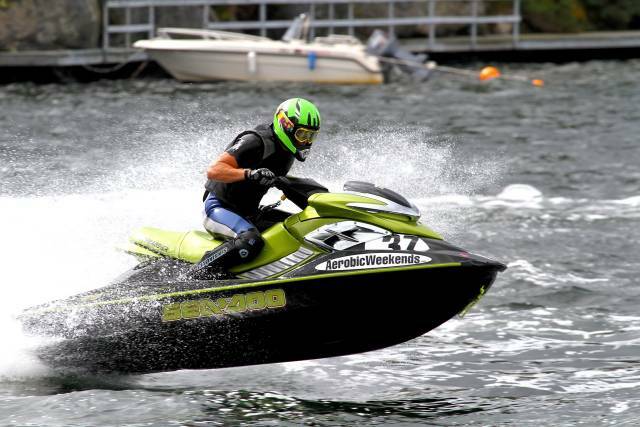 110806 Together with my friend Henrik Bramsved at Aerobic Weekends I am going to Hen�n Orust to participate in the Swedish Championship in Jet Ski and Runabouts. 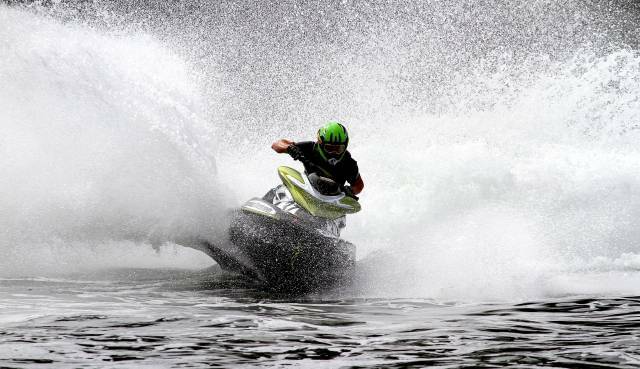 The comp is being held in Hen�n and I will compete in the Runabout stock race. More action photos and video will be posted so stay Ziped!! 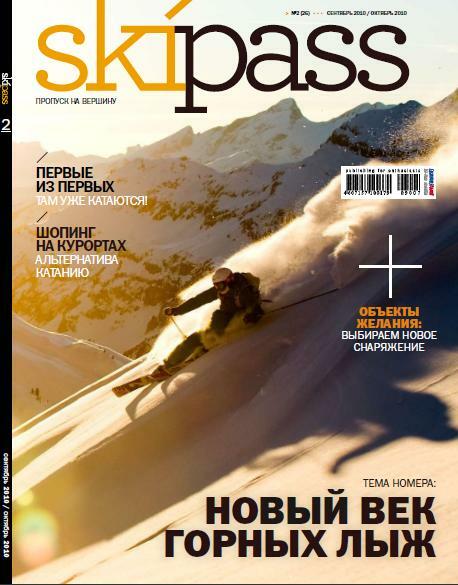 Russia BM photo annual - Photos in this issue were mainly taken in Disentis, Engelberg and Muerren in Switzerland during a roadtrip together with photographer Jesper Molin and skiers Johan Carlborg and Linus Archibald. 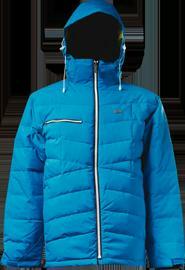 110227 ELAN - New skisponsor - I am happy to represent ELAN on the mountain from now on! Here is a picture of next years model "CHAINSAW" looking forward to test them... Underneath is also a couple photos taken by Jesper Molin from Are and Switzerland. 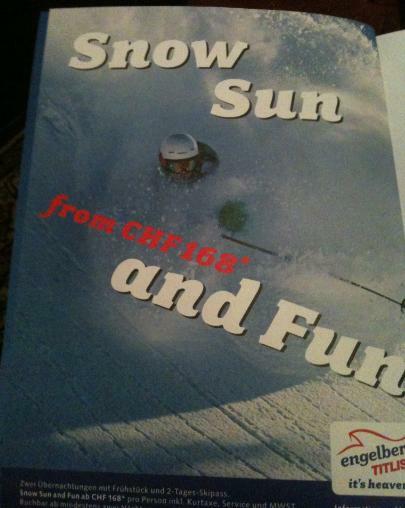 110225 One of last season "powderturns" resulted in this advertisement for Engelberg ... 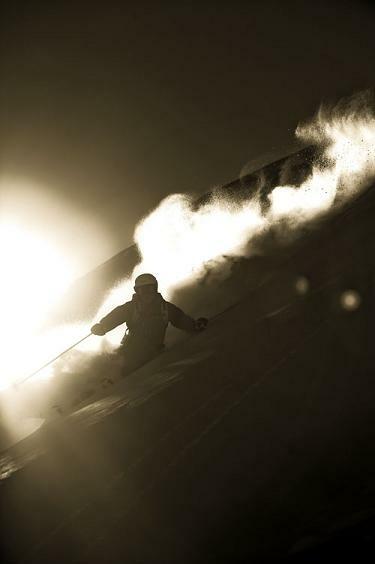 Snow Sun and Fun - Hell Yeah! Fredrik Schenholm took the photo. 110123 Photoshoot in Switzerland at the beginning of February! 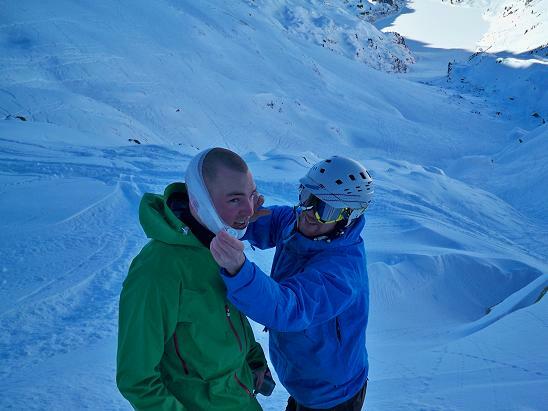 For the third consecutive year I am going back to Disentis/Muster together with my friends Linus Archibald, Oscar Hubinette and Jesper Molin. 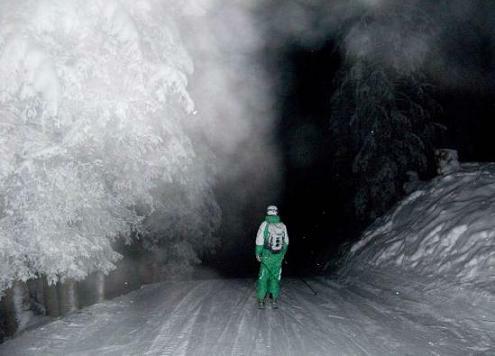 Lets pray it will keep snowing in the alps! Before the trip I will be working in Spain as a adventure guide, photos and updates will be posted so stay tuned! 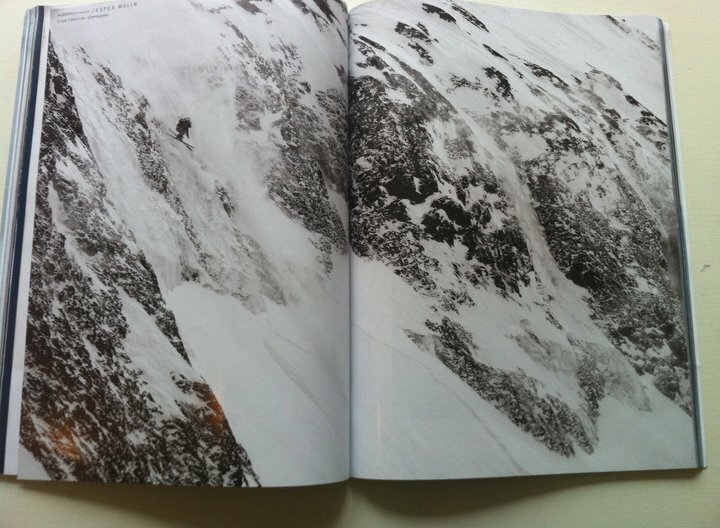 110120 After reading frequent updates at Facebook from my friends in Engelberg (with doubtful reports of powder and epic skiing) I just had to console myself with going through mine and photographer Jesper Molin latest work in Are. Check out this two frames for example! 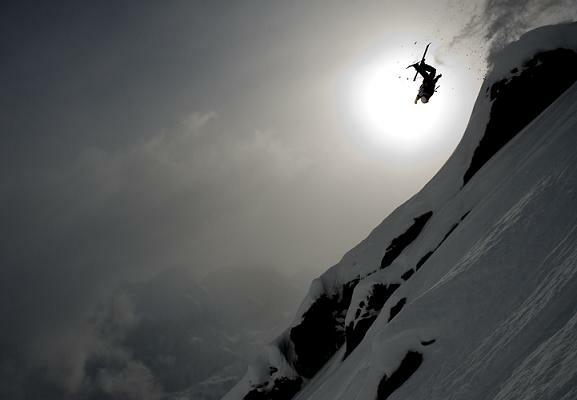 A couple of todays runs in Tegefjall captured through the lens of Jesper Molins camera. Mr Mute maybe you should have brought yourself and your new Nikon to Are? Reebok Jofa - I am happy to announce that I will keep representing Reebok during this season aswell! Are - 110106 I have spent the past few day in Are together with my friend and photographer Jesper Molin, during the last hours of todays skiing the sun broke trough and we got some brilliant photos! Photos - 101108 The gallery has been updated with some new action shots so check it out and get inspired! /Oskar DR ZIPE IS MY RELIGION ...the nurse keep telling me... - 101108 The quest goes on and I am happy to announce that I will be on the team also this season (probably more or less due to the fact that you get a shiny and matching gold coated box to the new Mistress level VII... I guess). 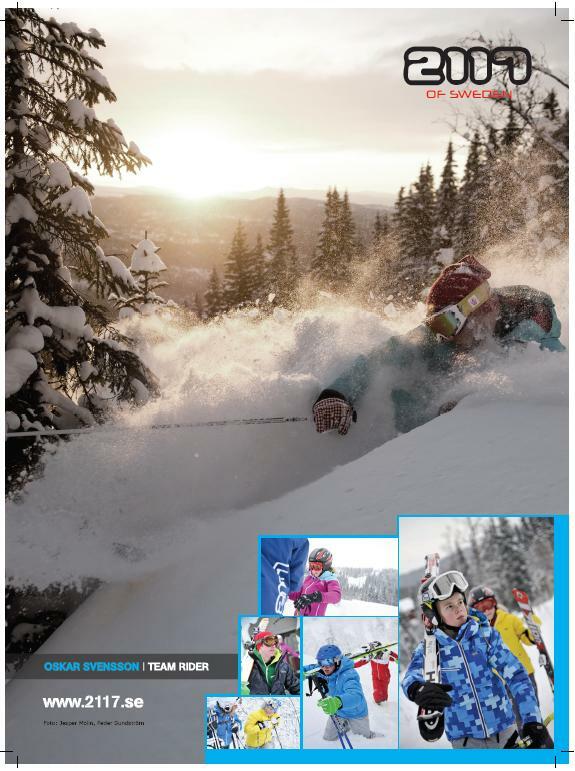 SWIX - 101030 Check out the website of my new sponsor, great ski poles! 101029 After a long day of hiking and skiing in Engelberg last winter me and Jesper found this great spot with a sick backdrop and light... - wanna go skiing? Photos - My homepage including the photogallery will soon be updated - so stay tuned! Eskilstuna Kuriren - 100601 My friend and photographer Per Sanden published a few skiing photos in the local newspaper earlier this week - check it out here (a larger copy will soon be posted). 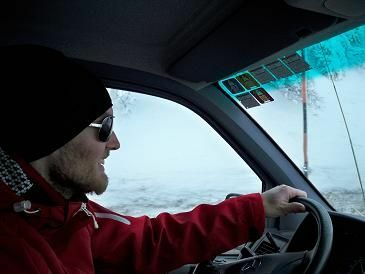 NM in Riksgransen - 100518 Today was supposed to be the qualification day here in Riksgransen but due to poor visibility the comp is postponed and the qualification will be held tommorow instead. 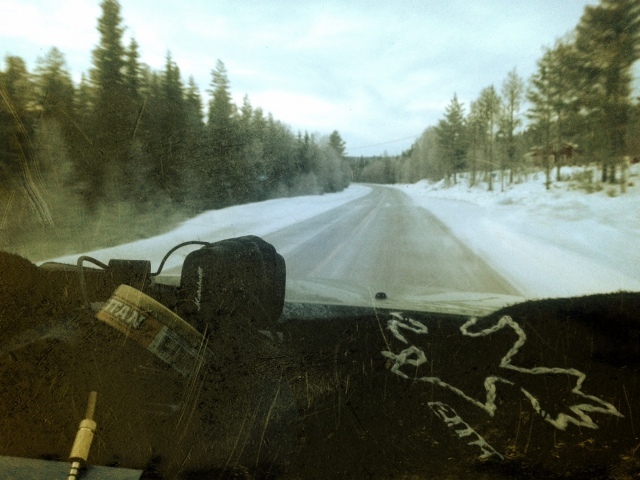 You can follow the race at www.bigmountain.se. 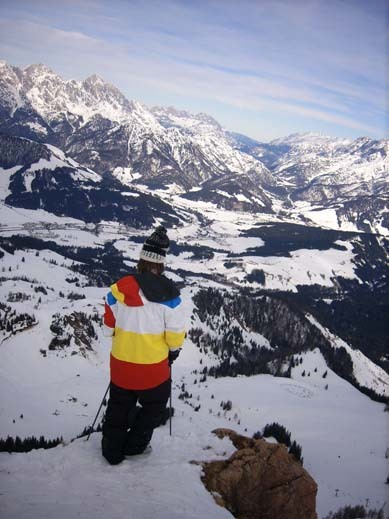 "Once you make that first turn, your life will be messed up forever" - Warren Miller 100511 ...And so we have applied to the sports college again, for the sixth time to be exact! Maybe I can begin this year anyway? 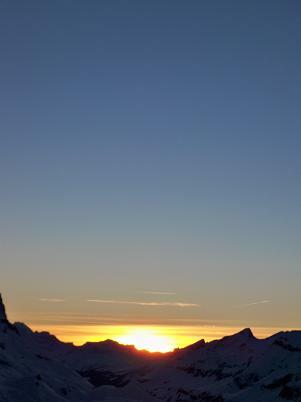 However - here is a great photo from Engelberg in March. The wind was heavy this this day and lots of sluf coming down and covering the take off point but with enough speed it all turned out good anyway! Summertime! Check out 2117 of Swedens new summer collection ! 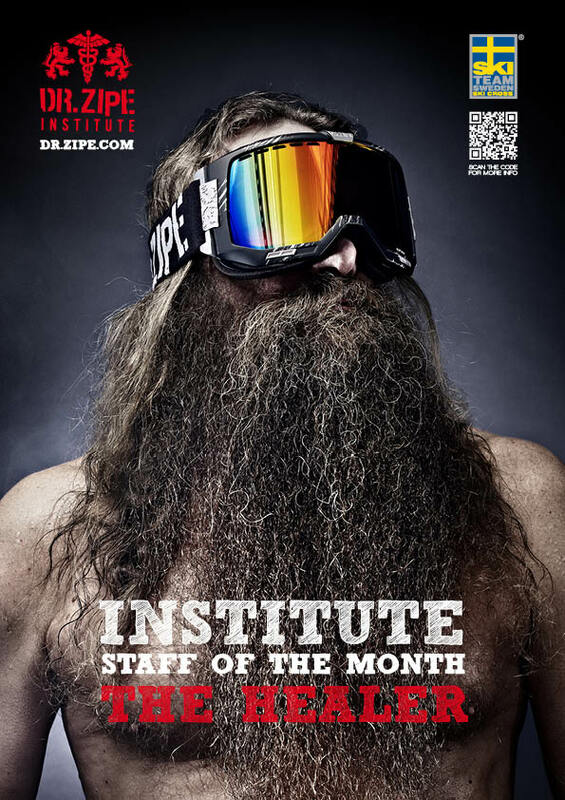 Dalbello Freeski Team - I have recently signed a new contract with Dalbello Ski Boots from Italy - Check out their stuf at www.dalbello.it ! DUZ Image - Check out my friend David Zappas Armchair-Project by clicking this link . 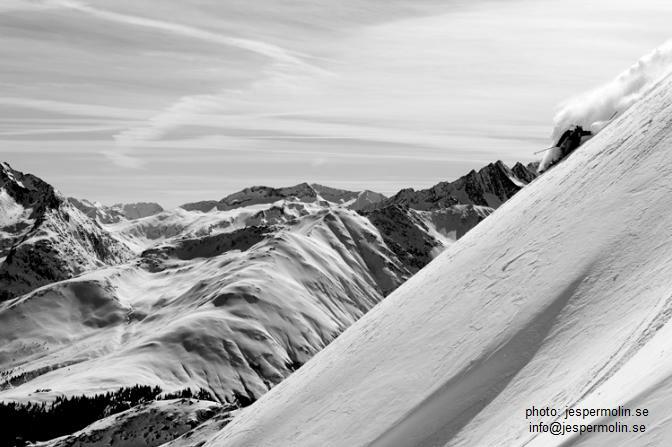 One image is taken from our photo trip to Arolla Ski resort earlier this season. This project is still under progress and will later on be showned in several exhibitions, great work! 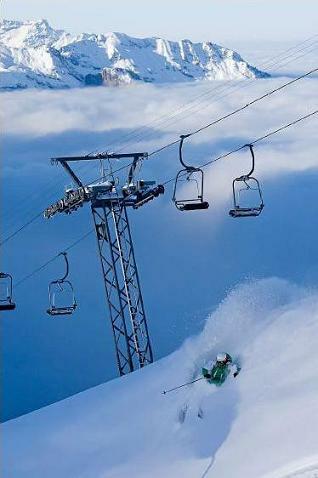 Powder in Engelberg! 100405 The past few days heavy snowfall has led to great conditions here in Engelberg and today was no exception - approximately 40 cm of fresh powder and clear sky during the afternoon. 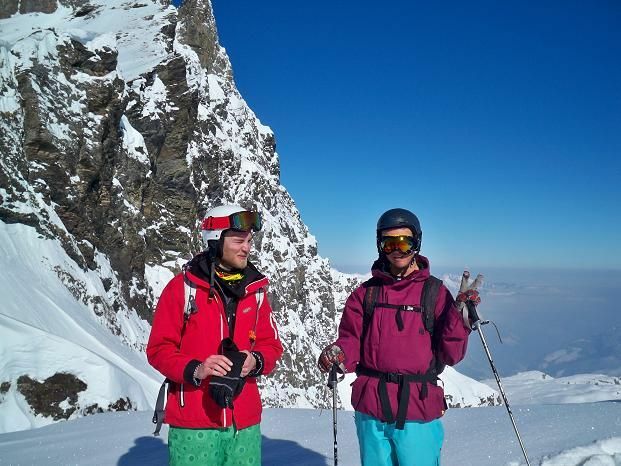 Together with my friend Linus Archibald and parts of the Ski Lodge Posse we had a great day on the mountain, perfect after being home in Sweden for one week! Back in Engelberg! 100315 After two weeks on the road we are finally back in Engelberg, before Jesper Molin and Johan Carlborg flew home to Sweden we had one day with great weather and snow here in Engelberg. 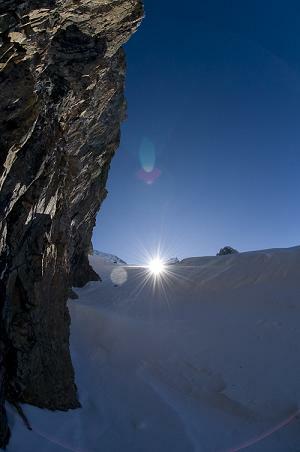 During the last session of the day I unfortunatly managed to hit rocks in the landing while jumping the ice in Steinberg. My skis broke but I am alright, I believe this confimrs that it s better to trie land on your feets rather than the hip or back! 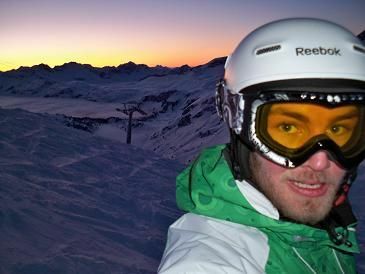 Linus Archibald above the top of Jochpass... just another day in paradise! Murren update... 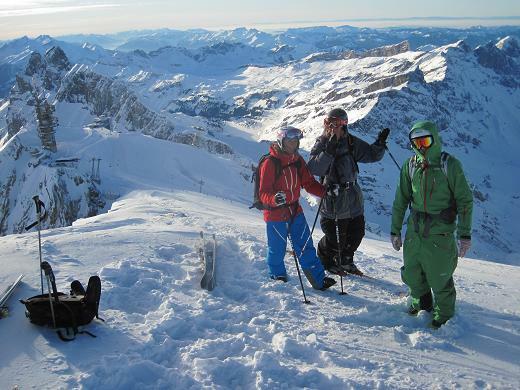 This is truly a varied skiing area - together with our local hero and mountain guide Fritz we have skied everything from big and untoched lines from the top of Schilthorn to some sick forest in the area of Winteregg! 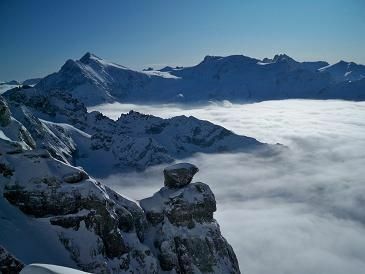 The view from the top of Schilthorn - 2970 m.a.s.l. 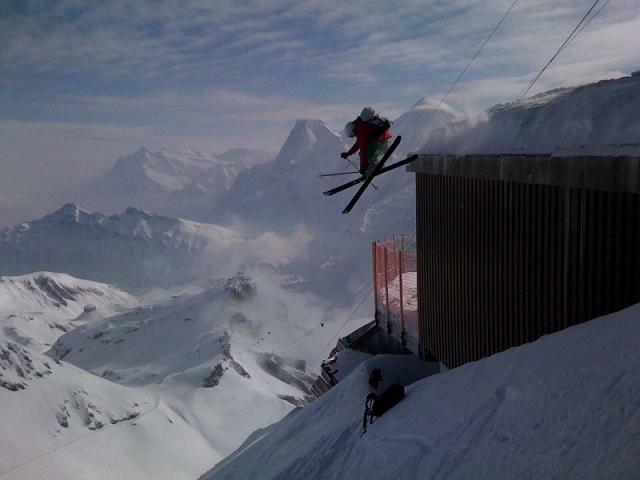 Jumping the roof from Schilthorn, taken trough the lens of Johan Carlborgs Iphone! Murren 100309 Yesterday night we drove of from Disentis and after some minor incidents on the road we reached our next stop - Murren - around midnight. (We didn t quite realize that our skimobile below was drinking gasoline like an elephant...) Anyway - this place is pretty unique, the village is situated on a plateau close to a 800 meter high and vertical wall and it is only accesses by cable car. 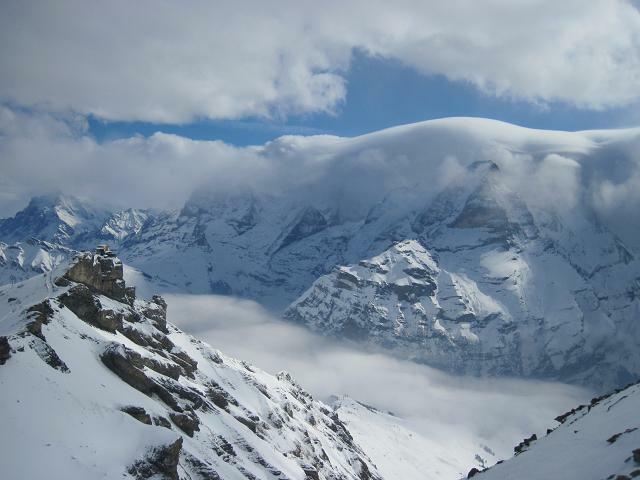 From our hotel Alpenruhe we can also see the dramatic north face of Eiger and the 4150 metre high Jungfrau summit, pretty stunning! FAT CAN From now I will start riding with Fatcan ski poles, check out their solid and stylish collection at www.fatcan.com! Better days! 100308 Since the weather has been pretty crappy during our visit here in Disentis we where all stoked to wake up to clear blue skies and some fresh snow! 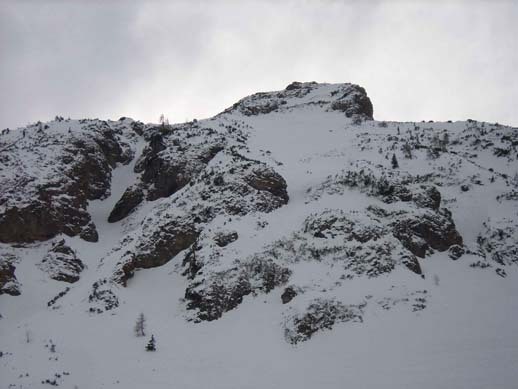 Below you can see some nice chutes from the upper part of the mountain. Apathy in Disentis... 100304 After a few days of mellow weather, dliffjumps with hard landings and innumerable lefturns in front of the flash the fog has finally struck Disentis. Together with my fellow friends Linus Archibald and Jesper Molin behind the camera we are now spending most of our time at the local bar Nangijala trying to keep the mood up with imported Super Bock, at the moment 2 for 1 so there is still hope! 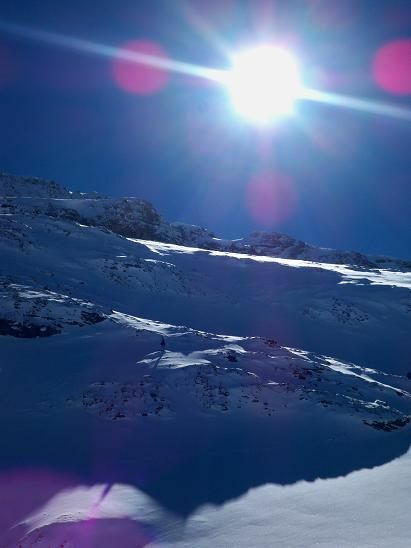 The magnificant view from Disentis alpine restaurant. 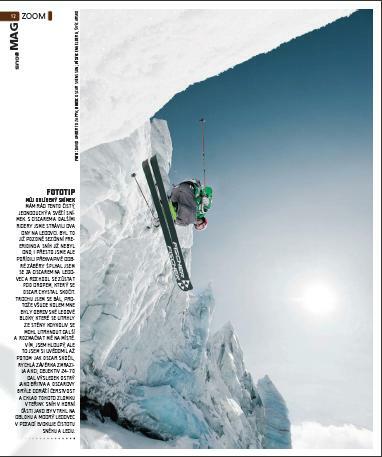 While reading an article in the all amercian Powder Magazine - about jaded young guns - I found myself up in the corner skiing on rocks... quite a surprise! The photo is taken by David Zappa. While we are doing the best drinking our sorrows away while waiting for the pow - The boys of Secondhands production mostly checking their status on Facebook... Weird?! 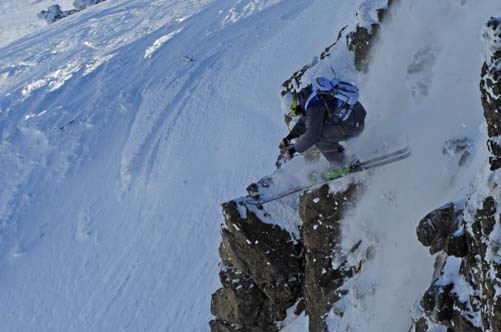 Nissan Mystic Experience 2010 My broken ribs are getting better and the last days days I have been out skiing here in Engelberg, everything is tracked out but I am super stoked to be riding again! 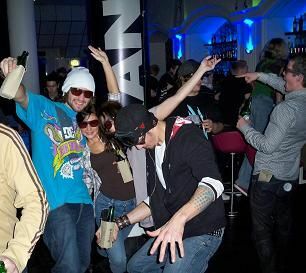 So finally I decided to go with my friends to the FWQ comp in Italy this weekend... Weather looks a bit crappy but hopefully good enough to race! 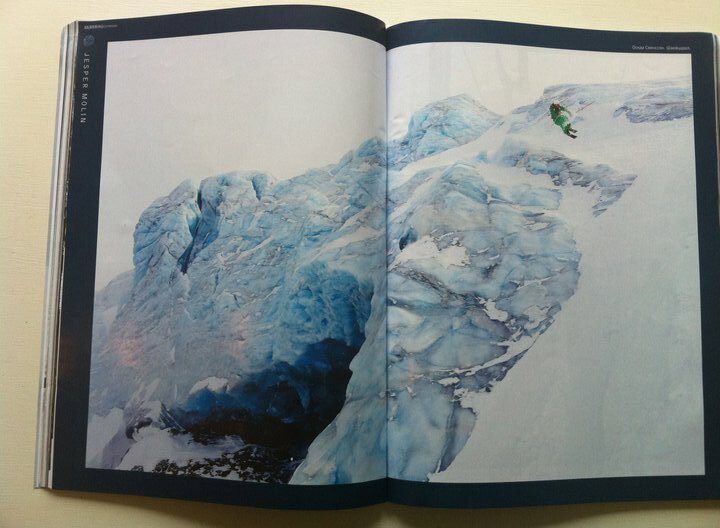 BRANT 100217 Here is a picture from the last issue of Brant, photo by: Fredrik Schenholm. Arolla update... 100204 Here comes a couple more pics from our trip to Arolla. 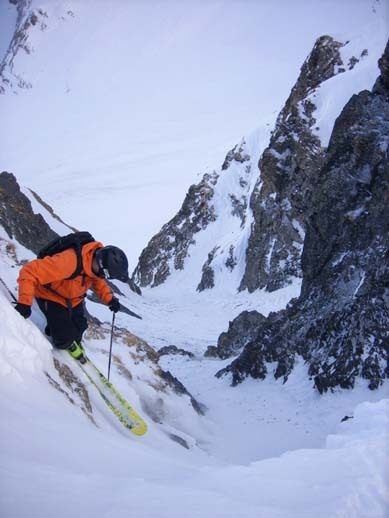 Big thanks to Andre Anzevui at freerideexperience.ch, Pascal Charlet from Coeur du Valais and the crew at Grand Hotel Kurhaus. This place is truly worth a visit! BRANT 100129 I got a nice photo published in the new issue of brant magazine, check it out! I will upload a image from the mag later... Photo by Fredrik Schenholm, www.schenholm.se. Arolla 100129 Driving to Arolla is nothing for the faint hearted, the road is winding and narrow and goes up above 2000 m.a.s.l. 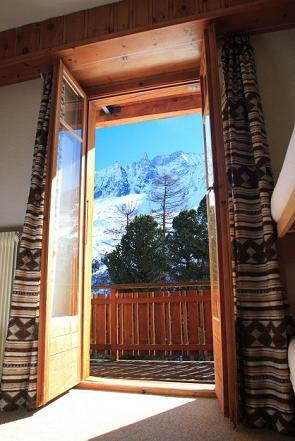 Our hotel is located close to the skilifts and the view from the room is stunning. 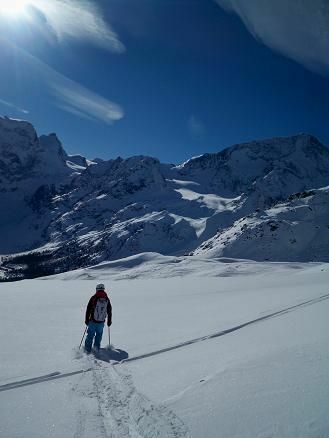 Unfortunatly our first day here in Arolla was just a big white out so we did not get much done. 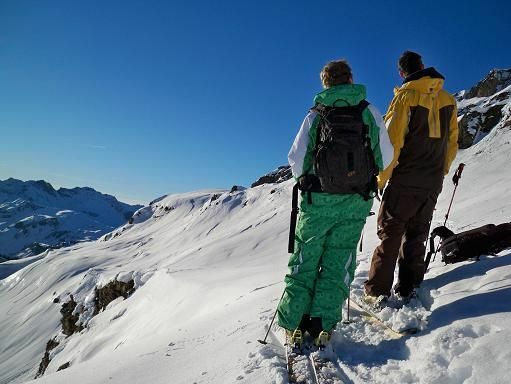 Wednesday was better, we had bluebird almost the whole day and even if it was almost four weeks since last snowfall we actually managed to find some untracked snow. Roadtrip The upcoming week Oscar Hubinette, David Zappa from DUZ image, Richard Amacker and I will head to the south of Swiss for some photoshooting. 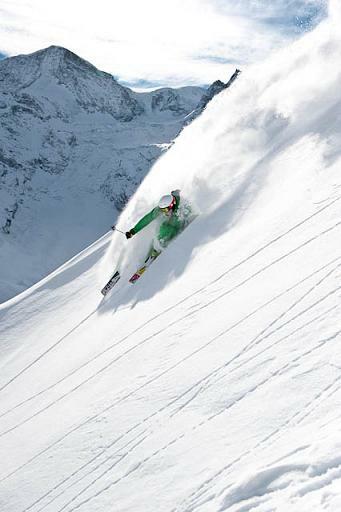 First stop will be a small and relatively unknown skiresort called Arolla. I will get back with some updates as soon as we are there! 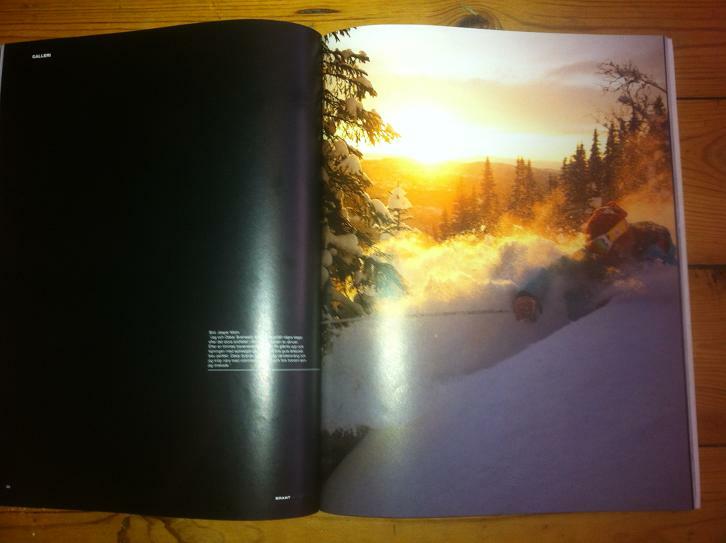 100124 Last week have been full of freeriding and shooting together with Jesper Molin www.jespermolin.se. Unfortunatly I managed to cut my chin twice when jumping some cliffs so know I dont look to pretty... Anyway, here are some photos from the last days. 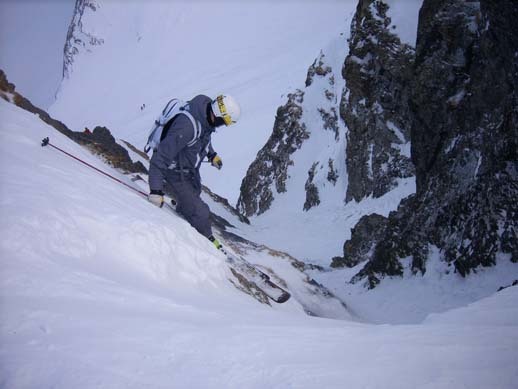 On the left is a classic cliff wich unforutnatly led to another cut in my chin, to the right my friend Larssa doing his best to take care of the after effects. What would I do without him? 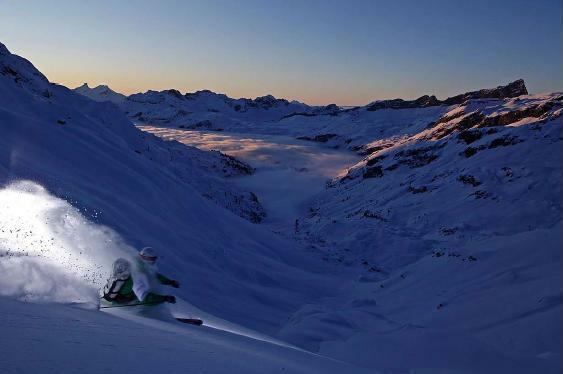 On the left I am waiting to drop in at Graustock and to the right it is the alpenglow burning the last hour of shooting in Engstlenalp. 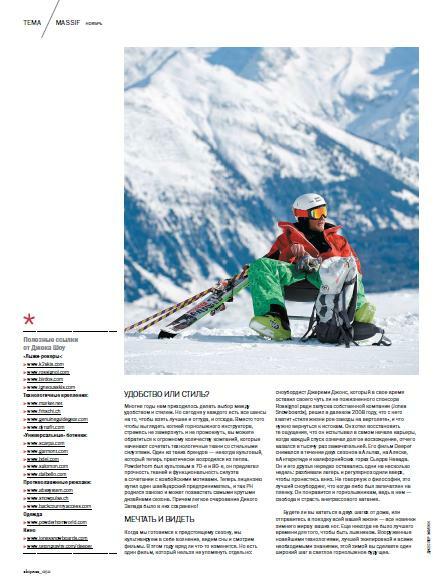 100111 Just got this three pages published in an article about Engelberg at the Italian freeski magazin 4Skier. 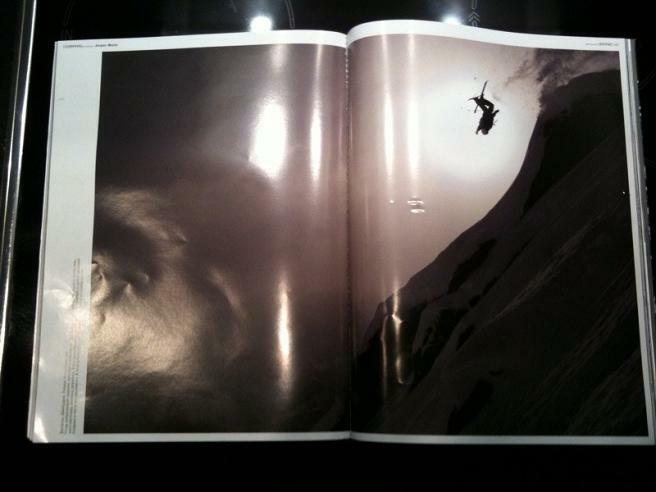 Go to www.4skiers.it for more info about the magazine. Photo and writer of the article: David Zappa at DUZ Image. 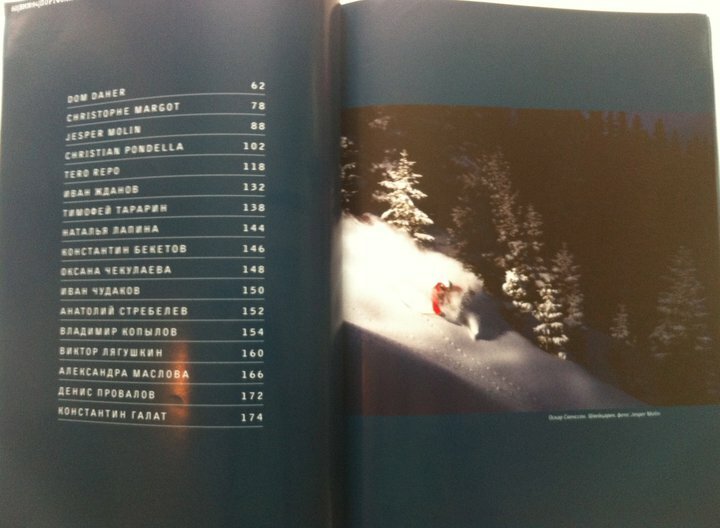 100108 This photo from Disentis just got published in the photo annual of 2009 in the Russian ski magazine BM. Photo by Jepser Molin. 100106 After some work in Sweden around New Year I am back in Engelberg again and today Titlis offered blue skys and powder snow above about 2000m. Together with my friend Daniel Furberg www.danielfurberg.com and Tommy "Mr Duct Tape" Snowboarder we where riding Steinberg over and over... 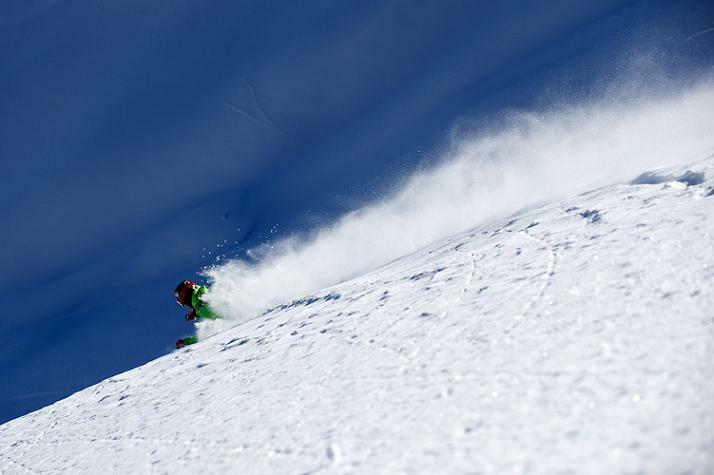 Tomorrow we are heading for Andermatt for some freeriding and photo shooting. 091223 Here are a few photos from our sessions with Fredrik last week in Engelberg, in the evening we had som really cool light and snow was peerless! To contact Fredrik use info@schenholm.com or make a visit at his website www.schenholm.com. 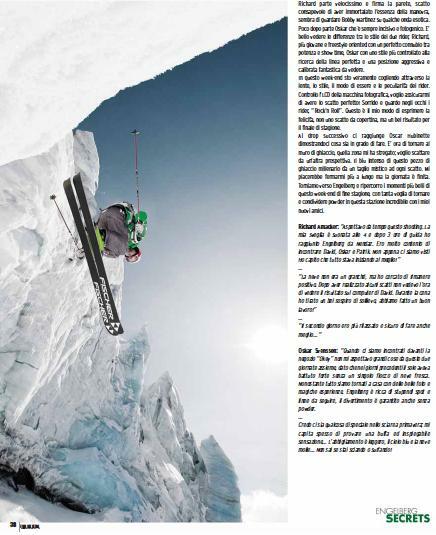 4Skiers Magazine 091215 At the moment they start printing the next issue of the Italian freeski magazine 4Skiers, together with David Zappa at DUZ Image and a couple other riders I got a nice article published about late season freeriding in Engelberg. 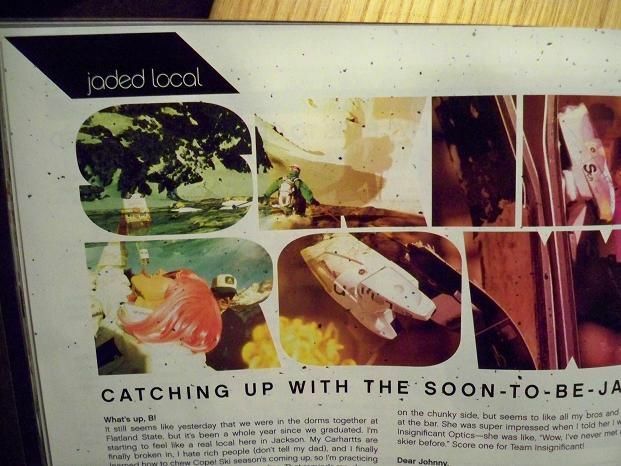 Stay tuned for some pics from the mag! New number! Unfortunately I had to change my Swiss phone number, here is the new one; 0041767864567. Engelberg 091204 After lots of coffe and about twenty hours me, Anna and Uffe finally drove in to Engelberg! 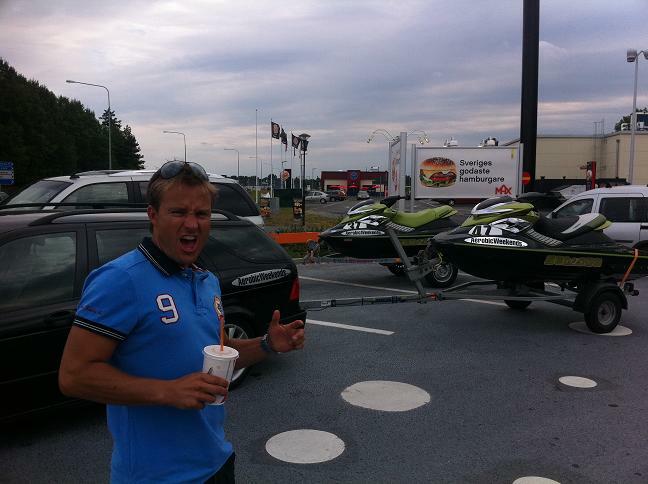 Waiting for the ferry in Denmark... 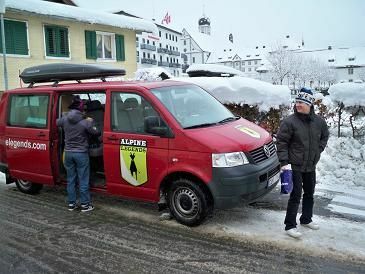 Arriving at Alpine legends headquarter in Engelberg! 091128 DR ZIPEand BRANT hosted a rememberable party in Stockholm last weekend! I brought some friends from back home and we had the perfect kick off for the upcoming season! 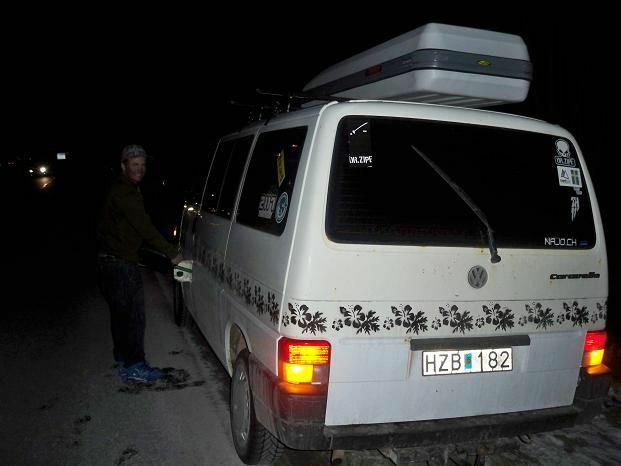 Got fuel to burn, got roads to drive - Neil Young 1989 091120 I got a call from Anna at Alpine legends today, they are driving to Engelberg on December second and luckily I get to help them with the driving this year aswell! Drop by their homepage and read about the most dedicated travel organization I have ever met! Climbing and coffe, a classic combo! 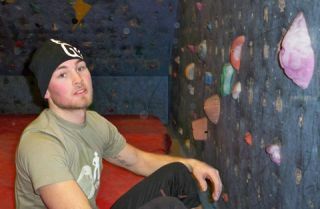 091120 Yesterday I met up with my old friend Anders Wilson at Eskilstuna Klatterklubb. He is one of Swedens top climbers so I was a little nervous for having a hard time but it all ended in lots of coffe and some really nice lines both at the boulder and the big wall. While I have some issues with a purple boulder line Anders is more like running around in a horizontal mode. Wich only confirms my theories that Anders recently must have mutated into Spider man... 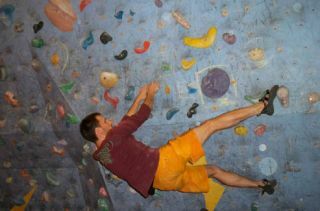 He recently climbed a 8b called "Breaking the law", heavy! 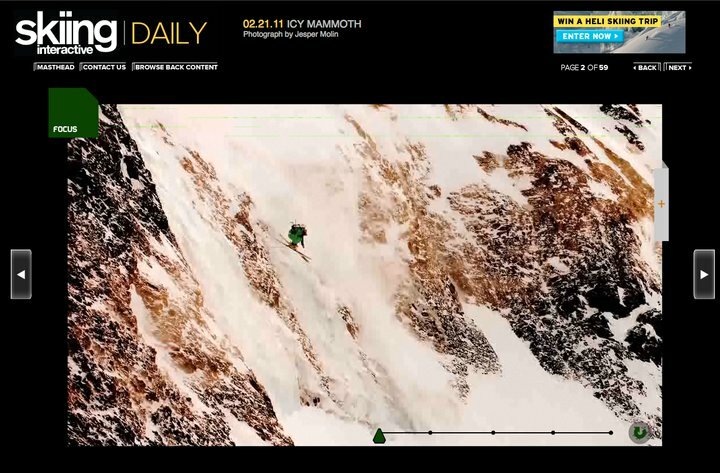 090922 I recently got three pages published in the freeride magazine Snow Mag, if you scroll down the blog you can see the pictures. Photgrapher is David Umberto Zappa at DUZ image. Visit his new website www.duzimage.com ! 090915 Right now the upcoming winter season is being planned. I am moving back to Switzerland again in the beginning of December and I will stay there most of the time during winter and spring. The website is also being updated so stay tuned! 090512 - 090514 The last comeptition for the season and as usual it feels like "everybody" is present, except maybe the sun... But even though there was some bad weather coming in the race organizers managed to complete 3 out of 4 runs on Nordalsfjall. 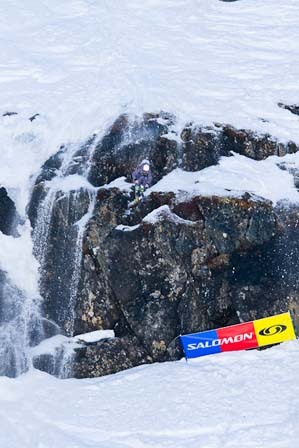 Unfortunatlfy I fell in the final after jumping a big cliff. After this I will head home and wait for the summer to kickoff! 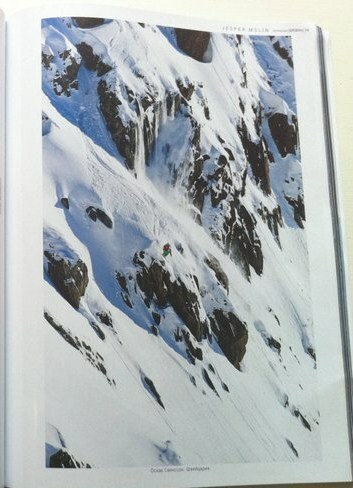 DUZ Image is coming to Engelberg for a photo session in the beginning of April. 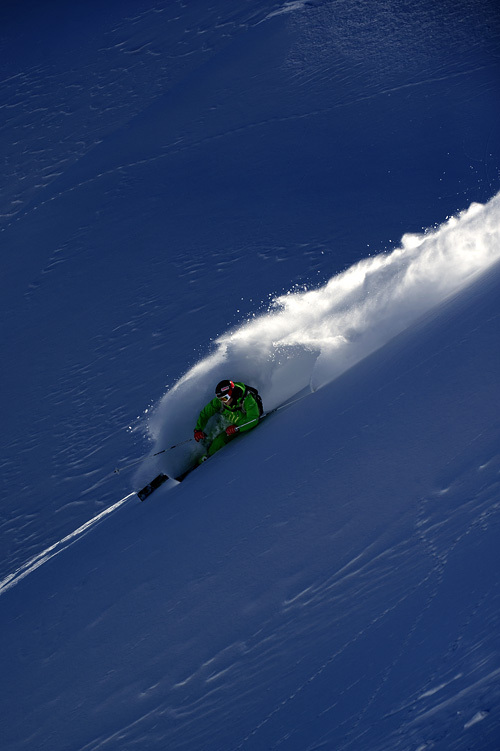 In the beginning of Mars I am going to Montafon for a photoshoot together with Jesper Molin and a few other riders, check out Jespers homepage and showroom! www.jespermolin.se. My portfolio will also soon be updated! 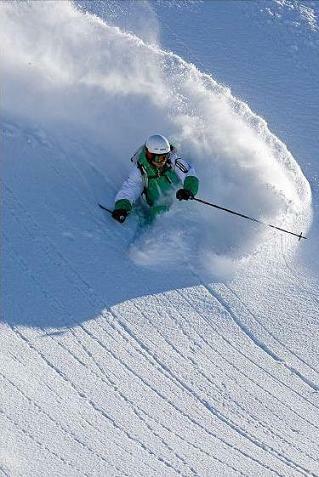 From the end of February I will start riding with Blizzard skis. Check it out! 090224 Last two weeks I have been travelling most of the time, after Fieberbrunn I went for a photoshoot in Disentis together with Jesper Molin, Patrik Leidstedt, Kristoffer Frenkel and parts of the Secondhandscrew. I seriously considered purchasing a snorkel while I was jumping from tree to tree in the forest. There was shitlouds of snow and from what I have seen we got some nice bangers there! 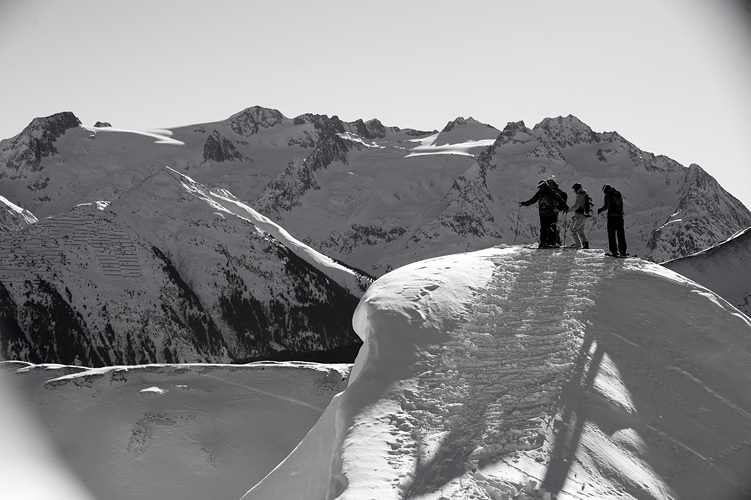 After that me and my friends from Engelberg headed for Winter Mystic Experience in Monterosa, the next Freeride world qualifer. 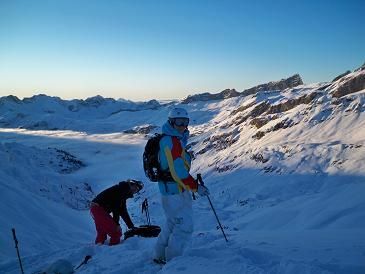 Unfortunately I crashed in to a tree so now I am back in Engelberg, riding powder with my friends and chilling a few days. 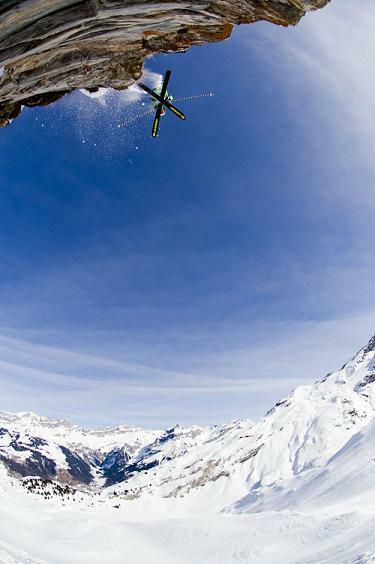 Rip it, dont slip it! 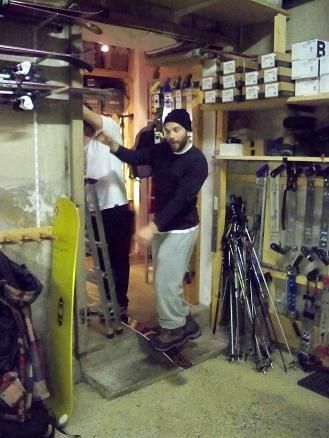 090202 Earlier today me and my friends Patrik Leidstedt and George Infanger came back from Munich and ISPO. After two days with lousy food and lots of walking I am looking forward to sleep in my own bed instead of a Volkswagen Caravelle. I must say that both 2117 OF SWEDEN and DR ZIPE had some really interesting things going on! 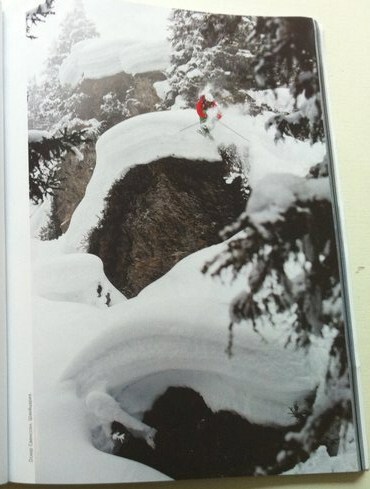 Tomorrow I will ski with my friends and then I am going to Fieberbrunn on Wednesday for the FWQ contest. The website will also be updated soon. 090107 By the end of next week the photographer Per Sanden is coming to Switzerland for approximately ten days so stay tuned for updates on the photogalley! 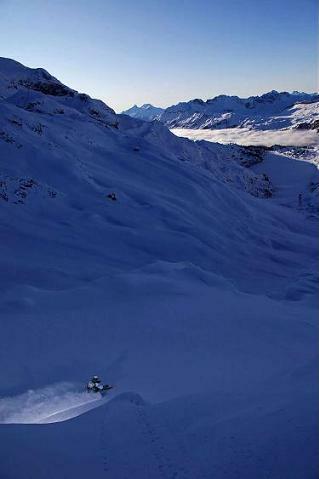 081222 After a few days with pretty lousy conditions there are lots of powder and blue sky in Engelberg again! 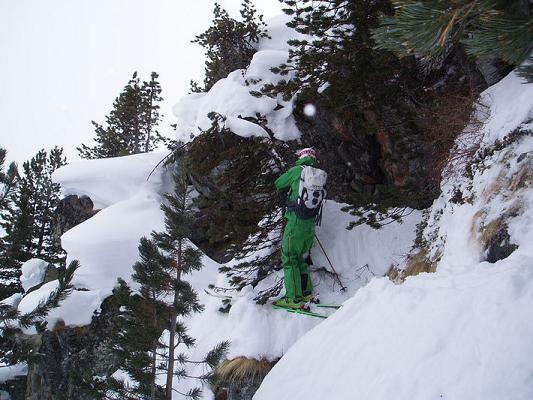 Today we have been skiing powder and dropping cliffs in "Zults" and yersterday afternoon me and my friends put first tracks on Steinberg, quite epic! 081205 After twentytwo hours and lots of coffee me and my friends finally arrived in Engelberg. 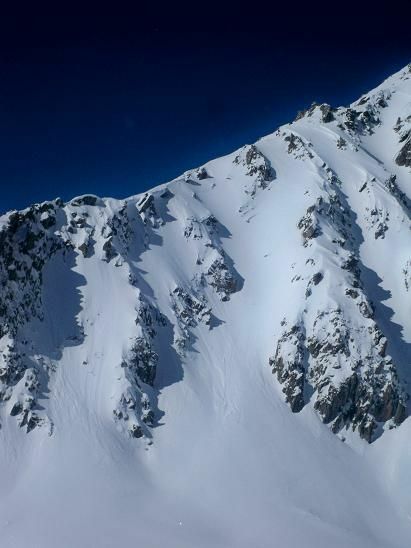 There are lots of snow here but the weather is getting warmer, hopefully that will give us a good snow base. Tonight I am working my first night at Spindle so now i need to get some sleep. 081113 Check out their WINTER 08 collection! 081010 I will use RbK/Jofa 6.5 Pump helmet and backprotection this winter. 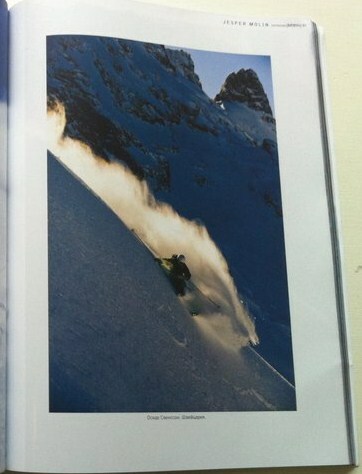 Check out their stuff at www.skistar.com/rbk !! 080915 Right now i?m planing the upcoming winterseason. At the end of November i?m going back to Switzerland and I will stay there most of the time during winter/spring. The website is also being updated. 080910 Robins Hood have opened their new webstore where you can buy the latest in skate, snow, surf and streetwear. www.robinshood.no check it out! !